The TS2280 6Gbps SAS interface enables it to connect to a wide spectrum of open-system servers. The LTO Ultrium 8 tape media provides partitioning support, which, in conjunction with IBM Spectrum Archive, provides users with file-level access to tape data. IBM Spectrum Archive supports the tape-oriented LTFS and helps reduce complexity by enabling a graphical user interface to the tape drive’s contents using the operating system file manager. These features together help make tape-based data as easy to find and access as disk- or flash-based data. 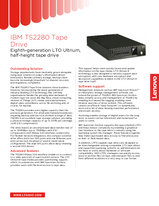 To learn more about the TS2280 Tape Drive, contact your Lenovo representative or Business Partner, or visit lenovo.com/storage. For more details, read the Product Guide. Trademarks: Lenovo and the Lenovo logo are trademarks or registered trademarks of Lenovo. Other company, product, or service names may be trademarks or service marks of others. Document number DS0037, published March 13, 2018. For the latest version, go to lenovopress.com/ds0037.